The trachea is a membrano-cartilaginous tube creating the start of lower respiratory passage and is non-collapsible. The Trachea is also called windpipe and it is a fibrocartilaginious tube that creates the beginning of the lower respiratory tract. 16-20 C-shaped rings of Hyaline cartilage keep its lumen distinct. A band of smooth muscle (Trachealis) and a fibroelastic ligament that bridges the gap between the posterior free ends of C-shaped cartilages, that allow expansion of esophagus during the passage of a bolus of the food. The arrangement of cartilages and elastic tissue in the tracheal wall prevents its kinking and obstruction during the movements of the head and neck. The trachea extends from the lower border of cricoid cartilage (corresponding to the lower border of C6 vertebra) in the neck to the lower border of T4 vertebra in the thorax. Thus upper half of the trachea lies in the neck (cervical part) and lower half in the superior mediastinum (thoracic part). C6 to T4 in cadaver placed in supine position. C6 to T6 in living individuals in standing position. C6 to T3 in newborn. The upper half of trachea can be found in the neck (cervical part) on the other hand the lower half is located in the superior mediastinum of the thoracic cavity (thoracic part). The trachea is a 4-6 inch (10-11 cm) long tube. The external diameter of the trachea is 2 cm in men and 1.5 cm in females. The lumen is smaller in living human than that in cadavers. It’s about 3 millimetres in newborns and remains so up to the third year of life; afterwards the lumen grows by 1 millimetre every year up to 12 years, after which it stays reasonably steady. This knowledge is really essential for the anaesthetists to choose the correct size of the tracheal tube to be inserted into the trachea in children during general anaesthesia. The trachea is the continuation of the larynx and begins at the lower border of the cricoid cartilage in the level of C6 vertebra, about 5 cm above the jugular notch. It enters the thoracic inlet in the midline and enters downwards and backwards behind the manubrium to terminate by bifurcating into 2 principal bronchi, a little to the right side at the lower border of T4 vertebra corresponding to the sternal angle. The trachea consists of about 16-20 C-shaped rings of hyaline cartilage being located one above the other the cartilages are deficient posteriorly where the gap is filled up by connective tissue and involuntary muscle termed trachealis the absence of cartilages on the posterior aspect enables growth of esophagus during deglutition in cross section the trachea seems d-shaped or horseshoe-shaped. The cervical part of the trachea is all about 7 cm in length and stretches from the lower border of cricoid cartilage to the upper border of manubrium sterni. It goes downwards and somewhat backwards in front of the esophagus following the curvature of the cervical spine and enters the thoracic cavity in the median plane with small deviation on the right side. the lobe of thyroid gland going to the 5th or 6th tracheal ring and common carotid artery in the carotid sheath. It is composed of lining epithelium and lamina propria. Lining epithelium is pseudostratified ciliated columnar with few goblets cells. Lamina propria is composed of longitudinal elastic fibres. It is composed of loose areolar tissue consisting of a large number of serous and mucous glands. Cartilage and smooth muscle layer: It’s created from horseshoe-shaped (C-shaped) hyaline cartilaginous rings, that are deficient posteriorly. The posterior gap is filled up chiefly by the smooth muscle (trachealis) and fibroelastic fibres. Perichondrium: It encloses the cartilage. Fibrous membrane: It’s a layer of dense connective tissue, consisting of neurovascular structure. There’s no clear difference between lamina propria and submucosa. The arterial supply of the cervical part of the trachea is derived primarily from branches of the inferior thyroid arteries. 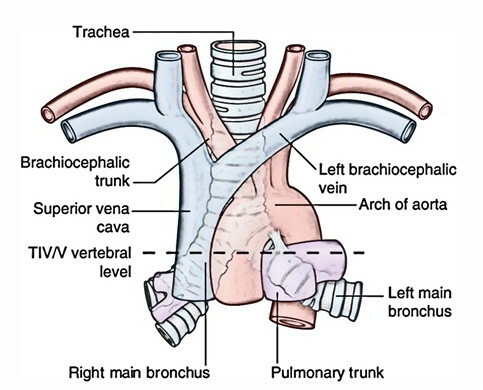 The veins from trachea drain into the left brachiocephalic vein. The lymph from trachea drains into pre and paratracheal nodes. This is by sympathetic and parasympathetic fibres. The parasympathetic fibres are originated from vagus via the recurrent laryngeal nerve. They’re secretomotor and sensory to the mucus membrane and motor to the trachealis muscle. The sympathetic fibres are originated from the middle cervical sympathetic ganglion. They’re vasomotor in nature. It’s viewed as a vertical translucent shadow in front of cervico-thoracic spine. The translucency is because of the presence of air in the trachea. Medically, trachea is palpated in the suprasternal notch. Normally, it’s median in position but appreciable shift of trachea to left or right side indicates the mediastinal shift. It’s a keel-like median ridge in the lumen in the bifurcation of the trachea. The lowest tracheal ring in the bifurcation of the trachea is thick in its central part. From the lower margin of the thick central part a keel-shaped (hook-shaped) process projects downwards and backwards between the left and right principal bronchi. It’s both functional and pathological importance. Functional importance: The mucosa of trachea over the carina is most sensitive. The cough reflex is generally started here, which helps to clear the sputum. Pathological importance: It’s visible as a sharp sagittal ridge in the tracheal bifurcation during bronchoscopy, for this reason, acts as a useful landmark. It’s located about 25 cm from the incisor teeth and 30 cm from the nostrils. If the tracheobronchial lymph nodes in the angle between the main (principal) bronchi are enlarged because of the spread of bronchiogenic carcinoma, the carina becomes distorted and flattened. It helps to trap the inhaled foreign particles and solid mucous is then expelled during coughing. The cilia of lining epithelium of mucous membrane also beat upwards pushing the mucous upwards. The fibroelastic ligament prevents overdistension of tracheal lumen while trachealis muscle reduces the diameter on contraction during coughing which involves increased velocity of expired air required for cleaning the air passages.